Inclusions: Stainless steel fridge, gas stove, built-in microwave, built-in dishwasher, front loading washer/dryer, electric light fixtures, window coverings, hot water tank (rental), armoire in front entry. Enjoy south facing spacious back yard and divine outdoor living space just in time for summer! 2 tiered party deck, natural barbeque gas line and fully enclosed yard is a great extension for play and entertaining space. 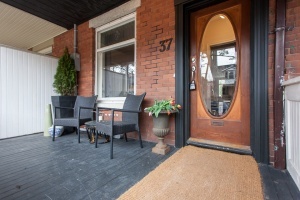 Priceless location on one of the most sought after streets in Roncesvalles Village -- pretty tree-lined street in the middle of the action, half a block to Roncy or Sorauren! This trendy area has been voted as one of the best neighbourhoods to live in Toronto. Raise your family within a block of Sorauren Park, or a short walk to High Park, excellent schools, shops, cool restaurants and plenty of public transit. Traditional Edwardian style curb appeal featuring a welcoming olde fashionedcovered front porch andoriginal door with beveled glass . Entertain in the spacious and stylish open concept principal rooms! The dining room features leaded glass windows, built-in shelving and pot lighting. Renovated, sun-filled Kraftmaid kitchen. Complete with quartz countertops, breakfast bar, stainless steel appliances including a gas range , ample cupboard space with soft-close drawers and a walk-out to the decks and south facing garden. Walk-out via cool new glass door with transom. Impressive master bedroom includes a large bay window and double closet with built-ins. Hardwood throughout the main and second floors. 2nd & 3rd bedrooms for kids or guests or home office with plenty of natural light. Double linen closet in hall. Renovated 4 piece family bath (2014)! Half tempered glass enclosure of deep soaker style tub, rainhead shower , sophisticated marble tile surround and custom built-in shelving. One of the attached neighbours with a similar floor plan has created a 3rd storey loft space with a staircase leading from the 2nd floor. An interesting opportunity to expand? Partially finished lower level has a guest bathroom, kids playroom, tons of storage space and a built-in laundry area with modern full-sized, front-loading washer &dryer. The house is mostly re-drywalled and in very good condition overall compared to many of the classic Roncesvalles homes. Enjoy spending time in the delightful back garden and decks with privacy fencing surround. Safe for dogs, kids and great for dining al fresco. Detached 1 car garage off the back laneway. Includes storage above parking spot, reinforced joists & cement floor, plus electric door opener. Exceptionally wonderful next door neighbours & warm vibe make this an ideal home & 'hood' to live and raise your family. Catch up with old and new friends at the annual street parties. 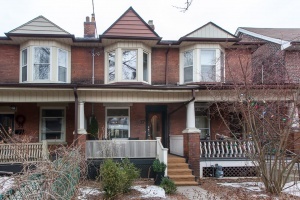 Superb Roncesvalles Village/High Park Location! As they say location location location! 37 Grenadier Road in a prime spot in the centre of the 'hood' west of Sorauren east of Roncesvalles. Even the proximity of being halfway up Roncesvalles helps to access all of the area amenities! The vibrant neighbourhood of Roncesvalles Village is a mix of old world and gentrification. Family-friendly and blessed with excellent transportation routes plus a varied commercial shopping district, this area also boasts parkland & recreational opportunities within walking distance. Desirable neighbourhood schools attracts many families with school age children -- Howard Jr PS, Fern Avenue Jr & Sr PS, St. Vincent de Paul Catholic School , Parkdale & Bloor Collegiate, High Park Alternative Jr. , High Park Gardens Montessori School to name a few. Stroll to such neighbourhood mainstays as Mitzi's Cafe, Qi Natural Foods, Scooter Girl, Dresser's, Pollocks Home Hardware, Revue Theatre, Fetch, The Chocolateria, Mabel's, Hugh's Room and Sobeys (conveniently open till midnight! 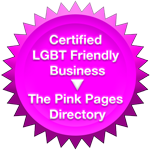 ), as well as Cherry Bomb, Rowe Farm, Custodio's and much more! Sorauren Park has an amazing Monday's farmers market, and enjoy the popular restaurants like Hopgoods Foodliner, Barque Smokehouse, Ace Restaurant & The Westerley! There are plenty of cool restaurants & shops on Queen West within reach as well. Attention families and dog owners! The entrance to the young children's' playground on the south west corner of Sorauren & Wabash is just a few blocks down the street! Sorauren Park is the neighbourhood gathering spot for kids play, tennis, soccer league, an official enclosed off-leash dog area, the pumpkin patch after Halloween, an outdoor skating rink plus the Wabash Centre & new Town Square. Fans of the great outdoors will appreciate being able to walk to High Park & the 399 acres of public parkland including an outdoor theatre, playgrounds, local zoo picnic grounds, lengthy off-leash areas, flower gardens a historic museum, and plenty of sports options. Easy access to Lake Ontario to cycle, blade, run or walk along The Martin Goodman Trail. Go Green! Get downtown in minutes -- easy access to Dundas West/ TTC Subway on the Bloor-Danforth line. 20 minute walk to GO train station next door. The Airport train link will soon be open there as well. Streetcars on Roncy via Queen, King or Dundas take you straight downtown.